Latest Garageband Alternatives for Windows PC: Hello Everyone! Are you a Windows OS user? Searching for Alternative of latest Garageband? Then we must say you are at the right post. The most annoying part of Garageband application is that it does not support the Windows OS platform. But Don’t Worry guys Today in this post We techTalkies365 team is going to share 5 latest garageband equivalent for windows. Garageband is not a new app to all the music fans all over the world. People Who are at the beginning or in advanced professionals do work it to create fantastic music. 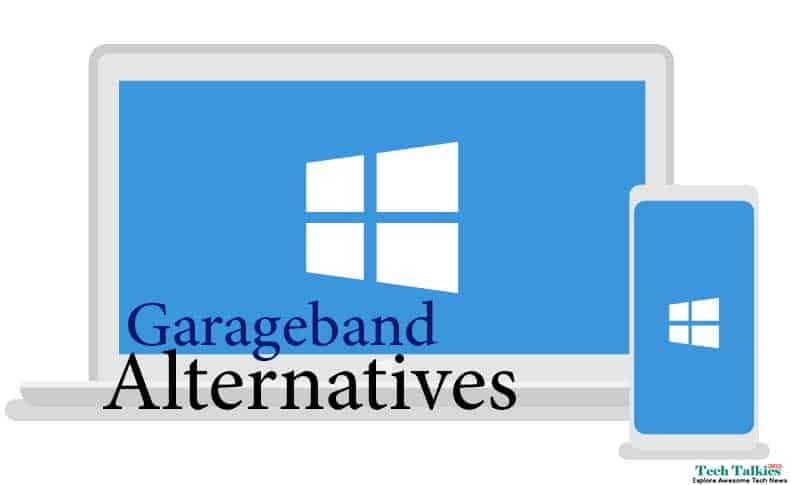 As I Already told Garageband does not support on Windows OS platform, But it is sufficiently useful and accessible only on the Mac and iOS platforms. But What to those people who are Windows PC user? Here is good news. Yes, Now you can use the latest Garageband alternatives for Windows PC without having any problem. Today, in this post We are going to share some latest alternatives to Garageband. So, Read the complete post from the beginning to the end. in this countdown consists of both free and paid windows version of GarageBand. In case you don’t want to use Any free or paid Garageband equivalent Version for Windows, then we recommended then get Garageband for PC. in this countdown, we have placed CUBASE Garageband alternative as a The first. Nowadays, this application is working perfectly in 9th version. All the Professional music creators love this tool. Users can Create music, record, and mix tracks as well without any issue like a Pro with the help of this application. Some best features make this application so much popular one of the most popular of the application is the Music output. CUBASE’s Professional music results can surely take down all the music lovers within minutes from the start of a track. Availability of special tools. It enables you to move around different genres freely. Allows you to create an impressive track. The Paid Version allows you to create more powerful and can record live shows. Garageband offers the same feature that is beneficial in Music editing and making digital audio like a Pro. If you are a beginner to the Music editing platform, MIXCRAFT7 is for you. The large building of loops offers it marvelous part of the application for you to give birth to a new track. MIXCRAFT7 also allows you to edit videos, by adding some plugins which create outstanding effects. to your project. Audiotool is another free application available for Windows PC. This is anis an engaging alternative to Garageband. The Feature Which makes this application most amazing is web-based application. So, Users can create or edit music even while you are on the move. It is like taking your music with you everywhere. You Can Draft or Save your incomplete Edited File and easily continue editing a file that you started at home. You Can Easily share the Music using YouTube, Soundcloud, and Facebook. Besides, you can find an amazing collaboration feature which makes this platform best alternative of Latest Garageband for Windows OS, Enables you the receptiveness to work with various tools and devices. The Most Popular Application Fro Building or Editing Tunes or Music is FL Studio 12. It has both free and premium versions. The Premium version allows its users with so many advanced professional level features and additional tools than the free version. FL Studio is one of the best GarageBand alternatives in 2019. It enables you to create Super Dance music. You can Complete your tasks with out having any hassle. It has a cool Recording and editing of music. Although the free version of this tool enables all these, the premium version gives you the key to browsing premium sounds and the chance to upload your audio. So, You can use this application Whether you are beginner or professional in this platform. If you liked the post don’t forget to share it with your friends.